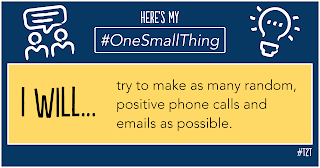 Teacher2Teacher has a super simple activity that has the potential to positively impact your classroom or school in a big way: One Small Thing. 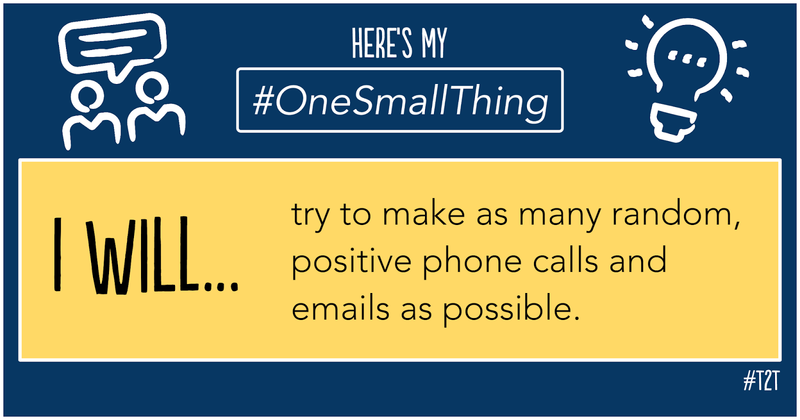 #OneSmallThing is based on the simple idea that a BIG impact comes from focusing on one small change at a time. I get to see almost every student each week through library/media classes, classroom visits, or just walking through the halls. Every day I see students learning great things, persevering through challenges, and being kind to one another. I commit to sharing my students' awesomeness with their families! Visit Teacher2Teacher to download an implementation toolkit that includes tips for success, suggestions for including colleagues, goal ideas, and templates.